Flowers white organza, acrylic beads, polyester, layette, shabby chic flowers, wedding, 3.00 cm in diameter by 5 flowers. Pink flowers, flower border white satin, organza, polyester, shabby chic flowers, sewing, wedding, 2.50 cm in diameter by 5 flowers. Flowers blue sky flowers organza border ribbons, barrettes, headband, shabby chic, lingerie, baby, 2.50 cm in diameter by 5 flowers. 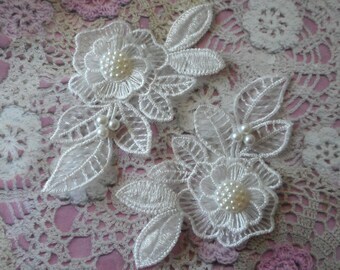 White flowers, organza flowers, polyester flowers, flower appliques, Cabochon, white pearls, wedding, 10.50 cm wide, by 2 flowers. Red flowers, organza flowers polyester, customisation, flowers, hair clips, headband, headband, 3.00 cm in diameter by 5 flowers.